Pithecellobium dulce is a species of flowering plant in the pea family, Fabaceae, that is native to the Pacific Coast and adjacent highlands of Mexico, Central America, and northern South America. It is an Introduced species and extensively naturalized in the Caribbean, Florida, Guam, India, Bangladesh, Sri Lanka, Pakistan, Thailand and the Philippines. It is considered an invasive species in Hawaii. Pithecellobium dulce is a tree that reaches a height of about 10 to 15 m (33 to 49 ft). Its trunk is spiny and its leaves are bipinnate. Each pinna has a single pair of ovate-oblong leaflets that are about 2 to 4 cm (0.79 to 1.57 in) long. The flowers are greenish-white, fragrant, sessile and reach about 12 cm (4.7 in) in length, though appear shorter due to coiling. The flowers produce a pod, which turns pink when ripe and opens to expose the seed arils; a pink or white, edible pulp. The pulp contains black shiny seeds that are circular and flat. The seed is dispersed via birds that feed on the sweet pulp. The tree is drought resistant and can survive in dry lands from sea level to an elevation of 1,500 m (4,900 ft), making it suitable for cultivation as a street tree. Depending on the region of its occurrence, Pithecellobium dulce is known by different names. In its native Mexico, the tree is known as huamuche, guamuche / huamúchil/ guamúchil / cuamúchil / deriving from its Nahuatl name cuauhmochitl. In the wider region, it is also called "pinzán"', or 'guamá americano (Puerto Rico). In Colombia it is known as “chiminango”. It is called "seema chintakaya" (సీమ చింతకాయ) in Telugu. Monkeypod is an English name but is also used for several other plants, including Albizia saman. Other names include blackbead, sweet Inga, ផ្លែអំពិលទឹក (Plaeh umpel tek) (Khmer), Makham thet i.e. Foreign Tamarind (Thai: มะขามเทศ), ʻopiuma (Hawaiian), kamunsil (Hiligaynon), damortis or kamantiris (Ilokano), kamachile (Tagalog), கொர்கலிக்காய்/ கோணக்காய்/ கோன புளியங்கா/ கொடுக்காப்புளி / கொடிக்காய் kodukkappuli or kodikkai (Tamil), ದೊರ ಹುಣಸೆ/ಸೀಮೆ ಹುಣಸೆ/ಇಲಾಚಿ ಕಾಯಿ/ಇಲಾಚ್-ಹುಂಚಿ ಕಾಯಿ dora hunase or seeme hunase or ilaichi kai or ilach-hunchi kai (Kannada), વિલાયતી આંબલી i.e. Foreign Tamarind - "બખાઇ આમ્બલી" i.e. "Bakhai Ambli" or Goras ambli (Gujarati), जलेबी i.e. Jalebi like or गंगा इमली i.e. Ganges Tamarind or विलायती इमली i.e. Foreign Tamarind or "'Singri"' i.e. "सिंगड़ी" (Hindi), জিলাপি i.e. Jilapi meaning Jalebi (Bengali), seeme hunase (Kannada), चिंच बुलाई or विलायती चिंच i.e. Foreign Tamarind" or "फिरंगी चिंच (Marathi) and "Achhi gidamiri" (Sindhi). 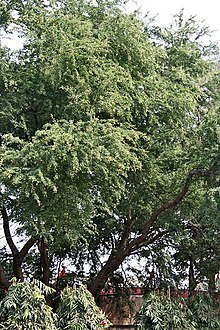 In India, it goes by the name "Madras thorn", although it is not native to Madras. The name "Manila tamarind" is also misleading, since it is neither closely related to tamarind nor native to Manila. In Kuwait, it has the same name as in India but in Arabic; "Showkat Madras". Showkat meaning "thorn" and that would mean Madras Thorn. It appears to have been introduced in Kuwait in the 60's or 70's and maybe introduced by Indians. One can still see the remains of the tree or living trees in the public parks established during the 60's up until the 1980s in Kuwait City. The tree is rarely sold in commercial nurseries but the old gardeners seem to know it. The seed pods contain a sweet and sour pulp which is eaten raw in Mexico and India as an accompaniment to various meat dishes and used as a base for drinks with sugar and water ('agua de guamúchil'). The seeds are said to be eaten (locally?) in the 'Revised handbook to the flora of Ceylon'  edited by M.D. Dassanayake (this information is not in the original 'Flora of Ceylon' of 1894). A number of studies since the 1980s have investigated the composition and possible uses of the seeds; it has been demonstrated that the seeds can be processed to extract a greenish oil, which when refined and analysed constitutes of potentially edible fatty acids (the precise composition varies depending on the study, but all agree oleic acid and palmitic acid are common, which is to be expected). Oils amount to 10-17% of the weight of the seeds. The seeds also contain 30-37.5-67.11% protein, which researchers suggest might in the future be used as animal feed. It is said to have been used as an antipyretic in India (information originally from 1933), used for eye inflammation, although an anecdote from Sri Lanka claims the bark contains a substance that causes eye infections and swelling of the eyelids. The Huastec people of northern Veracruz and San Luis Potosí in Mexico used different parts of the tree to treat gum ailments, toothache and cancer. The ground seed is sometimes traditionally used to clean ulcers. Pithecellobium dulce is a host plant for the caterpillars of the red-bordered pixie (Melanis pixe), three-spot grass yellow (Eurema blanda) and many other moths. Wikimedia Commons has media related to Pithecellobium dulce. ^ "Pithecellobium dulce - (Roxb.) Benth. Guama Americano". NatureServe Explorer. NatureServe. Retrieved 2010-09-19. ^ a b c "Pithecellobium dulce". Germplasm Resources Information Network (GRIN). Agricultural Research Service (ARS), United States Department of Agriculture (USDA). Retrieved 2010-03-29. ^ a b Trimen, Henry (1894). Flora of Ceylon. 2. London: Dulau & Co. pp. 131–132. doi:10.5962/bhl.title.10864. ^ a b c d Khanzada, Samina Kabir; Khanzada, Samina Kabir; Shaikh, Wazir; Ali, Syed Abid (April 2013). "Phytochemical studies on Pithecellobium dulce Benth. A medicinal plant of Sindh, Pakistan". Pakistan Journal of Botany. 45 (2): 557–561. Retrieved 19 July 2018. ^ "Pithecellobium dulce". Natural Resources Conservation Service PLANTS Database. USDA. Retrieved 6 October 2015. ^ Grandtner, Miroslav M. (2005). Elsevier's Dictionary of Trees: With Names in Latin, English, French, Spanish and Other Languages. 1. Elsevier. pp. 670–671. ISBN 978-0-444-51784-5. ^ a b c d e f g h i John A. Parrotta (January 1991). Pithecellobium dulce (Roxb.) Benth. Guamuchil, Madras thorn. Leguminosae (Mimosoideae.) Legume family (PDF) (Report). New Orleans, LA: USDA Forest Service, Southern Forest Experiment Station, Institute of Tropical Forestry. SO-ITF-SM-40. Retrieved 17 July 2018. ^ a b c "PlantFAdb Pithecellobium dulce - Monkeypod". plantfadb.org. Max Rubner-Institute & Michigan State University. 2016. Retrieved 19 July 2018. ^ Alcorn, Janis B. (1984). Huastec Mayan Ethnobotany. Austin: University of Texas Press. ISBN 978-0292715431. ^ "Red-bordered Pixie Melanis pixe (Boisduval, 1836)". Butterflies and Moths of North America. Retrieved 2010-09-19. ^ International Legume Database & Information Service (ILDIS) (2005): Pithecellobium dulce. Version 10.01, November 2005. Retrieved 25 July 2018.